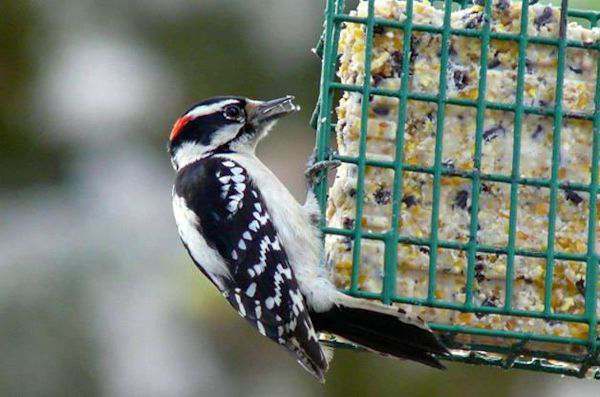 Looking for ideas on how to be a great backyard bird feeder? 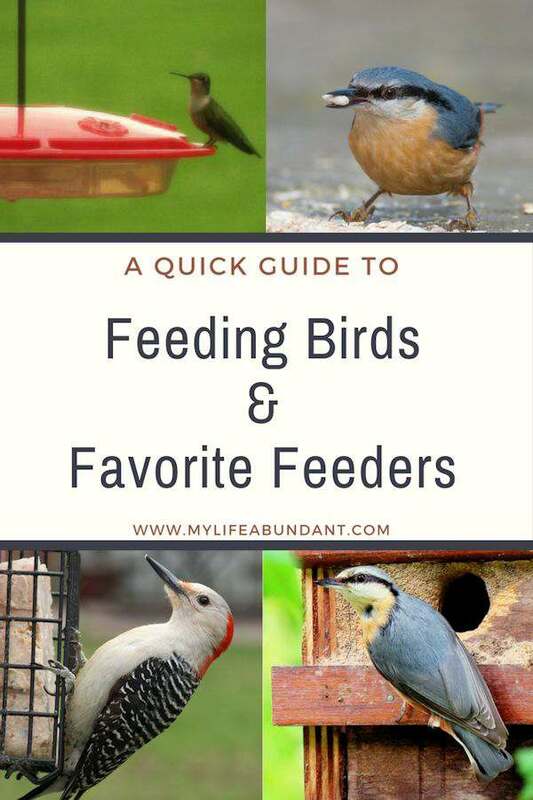 Here are my favorite feeders that I have used and some tips. One of my most favorite things to do is when I wake in the morning, I make my cup of tea and sit out on the lanai and watch the birds have their breakfast. Its so peaceful to watch all the different birds feeding and just starts off my day. Since I moved to Florida, I don’t see as many at my feeder as I use to. Not enough trees in my area and palms are not a favorite place for most birds to land on. If you are looking for feeders that work, here are my suggestions for ones I have used over the years. I have a very small backyard now, but just enough room for a couple of feeders. So, it doesn’t really matter what size yard you have to feed birds. I have found this to be a different scenario for different parts of the country. But, for the most part, fall through spring is the general idea. I do generally keep my feeders out all year long. But, there are exceptions. I don’t keep my thistle feeder out because goldfinches are only in my area from November until March. It’s helpful to find out what birds are in your area. I use a Florida Field Guide that helps me identify birds in my area. There are guides for every state. Black-Oil Sunflower is the most popular bird seed and attracts a variety of birds to your feeder. Blue jays, cardinals, chickadees, finches, nuthatches, and sparrows love it. 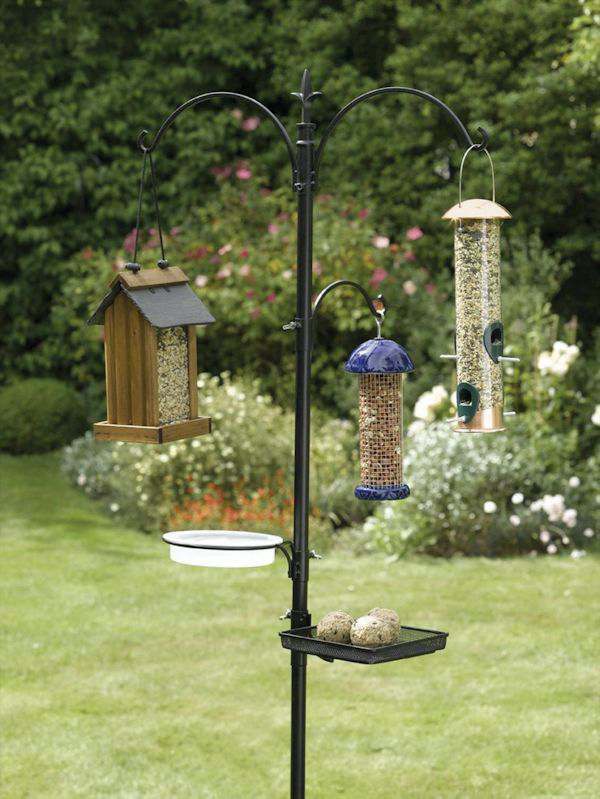 If you are new to feeding birds, then Black-oil sunflower seed is a great place to start! Thistle is a small, high quality, seed that goldfinches love. These birds have beautiful gold color and will come in droves to your feeder if you offer them thistle. Seed mixes are popular for beginners because they attract many different types of birds. They can be very messy because the birds will leave the hulls behind all over the ground or they will throw out what they don’t want on the ground. They will attract other animals to your feeder like squirrels which no one wants, but also your ground feeders, like doves, will pick up the leftovers too. There are “no mess” variety of seeds like sunflower hearts. Suet is basically a cake of animal fat and is a healthy source of protein for birds, especially in the winter months. Birds really need the fat in the harsh winter time to keep their energy up. There are several types of suet for different types of birds. You can also get some suet from your local butcher and place in a mesh sock to hang for them to eat. And in most case,s your butcher won’t charge you for the suet since they throw it out anyway. Nectar is colored sugar water for hummingbirds to enjoy. There are a few select other birds who love to drink nectar also. You can purchase the powder or make your own out of 4 parts water and 1 part sugar. 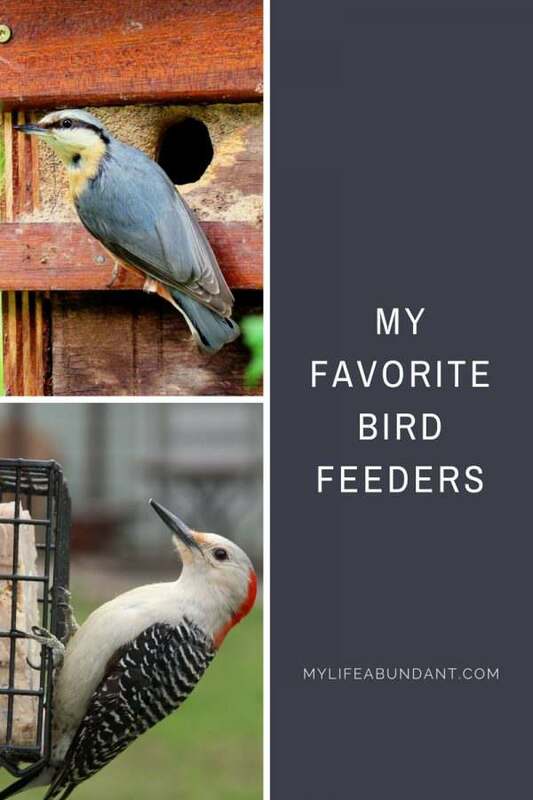 There are several feeders for different types of birds and the ones I will be listing below are the ones that I have used and are still using. The feeder I keep out all year is the More Birds Squirrel Proof feeder. It holds a lot of feed and the birds don’t seem to mind that there is only 2 perches to eat from. But, since moving to Florida, I don’t have the birds like I use to. If you have a lot of birds, there is a 4 perch version. Does it keep the squirrels away? So far, it has. They will crawl up the bird feeder hook and try to grab the feed from the hole but the pressure from his paw will cause the hole to close up. I haven’t seen a squirrel around that feeder for awhile now. I guess they gave up. TIP: I will put Vaseline or grease on the pole and will help keep squirrels from climbing up the bird feeder poles. I also have a squirrel guard above my feeder. When a squirrel tries to come from the top, they will slide off. It also helps with directing rain away too. I used this squirrel proof feeder for years until it just wore out. Its all metal and lasted for almost 10 years! 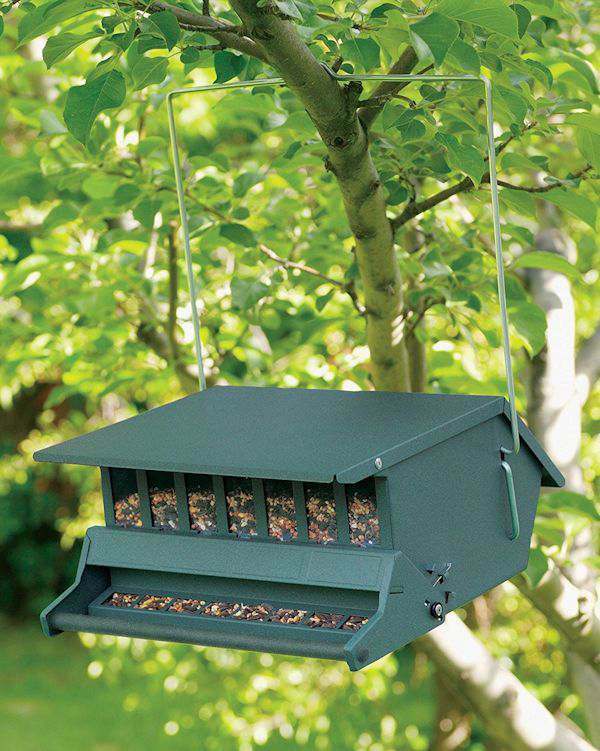 This feeder can be hung from a tree or hook or put on a pole. It really does keep the squirrels away. A tube feeder is perfect for the thistle seed to feed the Goldfinches. I had purchased a plastic version, to save money, and it fell apart in one season. So now I own a tube feeder with a metal cap and base, like the picture above, and it has lasted much longer. I hang this feeder in the crepe myrtle where there is left over flower seeds and have birds on it all day long. If you want a lot of birds to watch, this is the feeder to get. A simple cage suet feeder is a perfect solution for your suet cakes. Perfect for when the temps are low and you will attract some beautiful birds. This is the only time I see wood peckers. There are some no-melt suet for warmer weather, but I have found that the birds don’t seem to like those as well. But, it could be the birds in my area that doesn’t like them. I usually make my own suet and you can find my recipe here. The only humming bird feeder that works well for me and I have had for years is the HummZinger feeder. The perch is great and its really easy to clean and has held up very, very well in the hot Florida summers. I make my own nectar, as stated above, because it is cheaper and I can make a batch to keep in the fridge. I keep this feeder close to a tree or large bush because hummers love to perch in them. You can also plant certain flowers which they love to grab nectar from. The picture above is of the only hummer that visits my feeders the past few years. It may not be the same one, but my neighbors don’t have food for hummers, I just don’t see them like I did in Georgia. 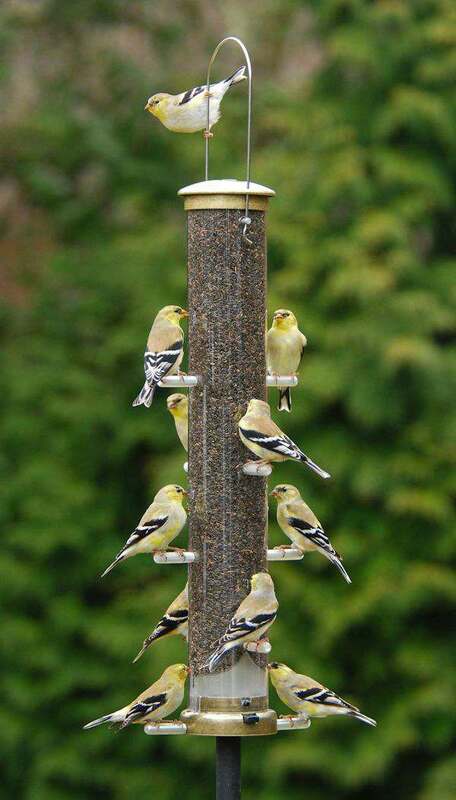 This multi-feeder pole is on my Wish List. I love that it has all the different hooks, a place for water and an open shelf for birds to have an open place to land to eat. That stand is certainly bird heaven. My daughter loves to feed our outdoor birds friends. We have a few feeders outside now but none are that great. I am going to have to look into your suggestions and maybe buy a new one. We were just looking at bird feeders this weekend! We got overwhelmed with all of the options and ended up going home empty handed. This is a very helpful post in helping us choose which one to buy! We have a bird table outside our living room window, in the summer I love watching the birds come and grab a bite to eat. We used to have a bird feeder when i was a kid at home. not anymore. The cat is scaring away the birds anyway. I like your list of bird feeders! I would really rather try to make my own! If you ever have time to write a post o n DIY bird feeders, i’d be first to read it! I greatly enjoyed this read about your favorite bird feeders. Here in my area of California we have a lot of trees and so many gorgeous birds. We also have a lot of squirrels, so the squirrel-proof feeders you mentioned will be a great fit for my yard. It such a special site to enjoy a leisurely morning drink or meal and take a peek outside and view little birds appreciating the delicious meal you’ve left for them. i live in a condo and we are not allowed to have this. however my father in law is a big fan and he has it at every corner! will surely show this to him. These are some fabulous feeders. I might have to get one for our yard. My daughter loves watching birds. My dad would love this. He has feeders all over his property! Bird mixes really works for me. I used to have birds in our home and we usually use this. Useful tips! Thanks! Wow, such a detailed and helpful post. I used to feed birds years ago but then apartments happened >.< I have been thinking to have a bird feeder now that i live in a house. I would love to try a few of these bird feeders. I love to sit in the yard and watch all the beautiful birds that come to visit. This is a great and easy guide. Bird feeding has always seemed so complicated to me but you make it easy. Thanks! We have a bird feeder and my daughters loves to watch the birds and take picture. I think we are getting another because One bird has taking it over. My mom always had bird feeders on her porch. We don’t have anywhere to really hang one. Maybe when we move we can. I would love to do that! Look at those birds you have attracted. I can sense a feeling of calmness as you gaze at them in the morning. We have one small feeder in the front of our house and my daughter LOVES to watch the birds! I want to get a few more to place around the yard! This is adorable. I barely see birder feeders anymore so this was refreshing. I love watching birds in the bird feeder! Thanks so much for your recommendations…. I’ll definitely be picking one of these out! There are a lot of ways to feed a bird. You might be overwhelmed when buying a bird feeder especially when you are just a new bird owner. 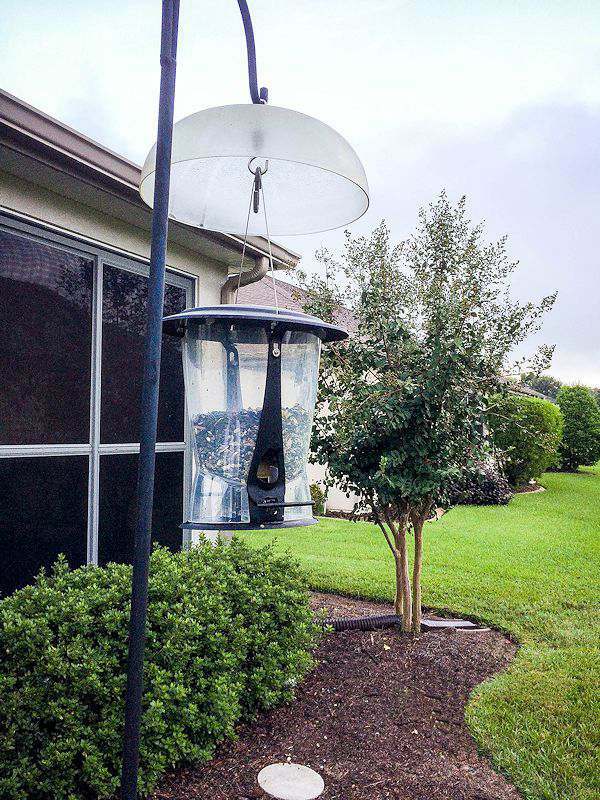 A very relevant post can probably help you decide what kind of bird feeder is best suited for your bird, house, and your budget.